Use this basic yet functional 13" perforated basting spoon for anything from straining vegetables to lifting and draining braised, poached, and seared foods. Made of smooth 18/8 stainless steel, this spoon will hold light or heavy dishes and drizzle the perfect amount of meat drippings over your most delicious dishes. The small equally spaced holes in the base of this spoon are perfect for quick draining of liquids and fats. Its black bakelite handle is engineered to be lightweight and more graspable than ordinary handle bases, and the convenient built-in notch will prevent this spoon from sliding into the pan. Bakelite handles are heat resistant up to 230 degrees Fahrenheit. Another great spoon from Webstaurant store. The 13" Perforated Basting Spoon with Coated Handle is well made and perfect for many tasks around the kitchen. My elderly father likes the coated handles, they are easier to grasp. The box which these came was broken and wanted to return them but I was told I would loose money if I return them so I had to keep them.. Other than that these spoons are nice..
You can use the 13" Perforated Basting Spoon with Coated Handle to serve Pinto beans without much of the liquid to guests and or loved ones. It fit well in my 930 pressure canner. This stainless steel basting spoon is made of a thick steel, which is sturdy and doesn't deform with use. Overall, a good value for its low price. Well made spoon, fit for any use you can think of. Black plastic handle stays cool. 13" length is perfect for use in most stock pots. Great value at this price. I love this spoon because of the plastic handle. I have been burned in the past by spoons that don’t have a plastic handle. The perforations are great for draining liquid from food. These perforated stainless steel spoons with a plastic coating on the handle came in a very timely fashion and is a great utensil. I use it all the time now. The 13" Standard Duty Perforated Stainless Steel Basting Spoon with Coated Handle is great for scooping noodles out of water. I use it all the time at y restaurant. These are great for serving at and function or event. I love them the crew loves the and the people that use them are just awed buy the quality and price. Love this handle. It protects my hand from getting to hot unlike spoons without the coated handle it is often very difficult to keep it from burning you if using it for a long period of time. The perforations in this spoon make it perfect for serving pasta directly from the pot. Saves you the step of having to pour the pasta into a strainer. This perforated spoon provides a great grip when I need to lift and separate cooked vegetables from the stock. It helps make such cooking successful! The coated handle on this stainless steel spoon makes it a great choice for a hot bar because it allows a customer to easily grip the spoon without the fear of burning themselves on a stainless end. This spoon is perforated making it the perfect choice when you need to drain a liquid from a food service item. i was pleasantly surprised with this spoon. it's really well constructed and of high quality materials. the plastic handles protect your hand against the heat and there is a little catch that prevents it from falling into your pot. such a good deal. The 13" Standard Duty Perforated Stainless Steel Basting Spoon with Coated Handle is great for serving side dishes like corn or green beans. The quality is good, especially for the low price. I would definitely purchase again if needed and highly recommend. The 13" standard duty perforated stainless steel basting spoon with coated handle is a great investment for your commercial kitchen. It is strong and sturdy and will last a long time if well taken care of. You will save a ton of money with this spoon. The 13' standard duty perforated stainless steel basting spoon with coated handle is great for all your tasks in the kitchen. We use it to dip peaches out of the large cans when we are trying to reserve the juice or other dishes. This product surprised me, for that price, you just don't know what to expect but the handle is comfortable and even if theres splashes doesn't slip out of your hands, I like this one a lot! This is a really nice stainless steel basting spoon. it is perforated so you can scoop up items out of liquid and drain it on the go. this is heavy duty and will last a while. This spoon does a great job in both home and commercial kitchens. It's easy to clean and the slit in the handle makes it easy to organize on a hook. great slotted spoon for many purpose with working with meats and soups, they are so cheap for the quality of spoon. the handle is nice too. Great stainless steel spoon with perforated holes so you get all of the meat and none of the grease when making taco meat or other things of that nature. Solid construction is super comfortable in the hand as well. 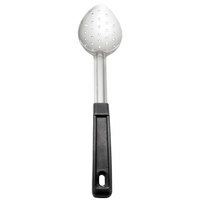 The 13" Standard Duty Perforated Stainless Steel Basting Spoon with Coated Handle is a great spoon. It is sturdy for thicks sauces and handle is comfortable. Sturdy and functional. Ergonomic with a good grip. Couldn't ask for much more in a perforated spoon. Price is just right. Should last a long time without abuse. This perforated or slotted spoon makes for a great presentation in a buffet. The handle is long and sturdy and the metal part of the spoon is quite thick and won't bend. It's a great value and very high quality. Nice looking spoons for our self serve buffet. They look very nice and are easy to clean in the dish machine. Would definitely recommend these spoons. I have never owned a spoon with a built in notch and this one is working out great. It is lightweight and easy to hold. very good come in fast. as i get it the brand is upstate, I like that brand. less price you will change them every two years anyway. Very sturdy and durable spoon. The black grip makes it easy to use and keeps us from burning our hand. Great product at a great price. The 13" Stainless Steel Perforated spoon is a great product to have for your catering event and hosting parties at home. The quality is great and the price is right. Excellent customer service. Again we got these over a year ago they are still look good, price was low and worth every penny. great use and recomend them. The 13" Stainless Steel Perforated Spoon. Eorks great for serving things like peas were you won't just a tad of juice.The handle is heat restent. You can't go wrong with this spoon. The quality is excelent as it wiol hold up to the heaviest uses you can ever think of. The perforated spoon is not heavy weight, but for the price you can't beat it. Perfectly sturdy for our use, and great in the dishwasher.